Whenever you need to send a payment request, or in other words, share a payment link with anyone - be it your customer or your family/friends, you should click on “Create a Payment Link”. This essentially means you are enabling others to pay to you using this link. You can set a purpose of payment on this link and this can be shared across any communication channel like WhatsApp, Email, SMS, Facebook, et all. Payment links will not clutter your online store, they are not be used for integration on your website as well. This is the simple “Pay with a link” that creates a personalised link with a payment purpose for you. How to create a payment link and start collecting payments online? Login to your Dashboard and Click on ‘Create a Payment Link’. 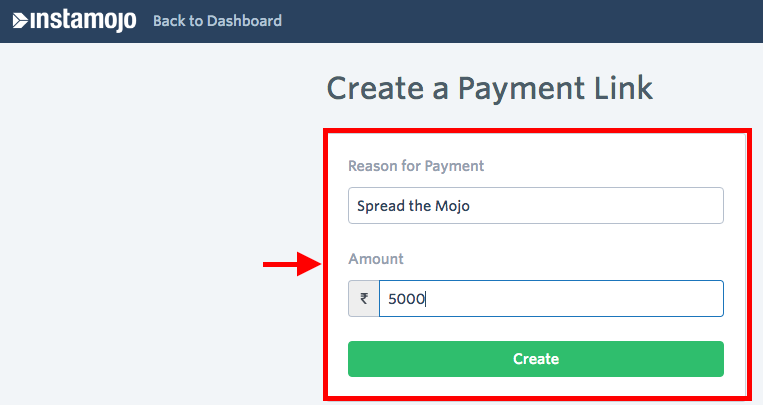 You can give the Reason for payment and Amount to create payment link. Once you click on create, you will see the page as it will appear to your buyers. You can share the payment link by clicking on Send button on the top right corner. You can share your payment link via Email,Twitter,Facebook or you can copy the link and share it on your blog or your page. If you have created the link on your mobile device, you can share the link using WhatsApp, SMS.